Planning to celebrate New Year's Eve in Stockholm, Sweden? It's a fantastic holiday destination, as it offers a wide variety of options to enjoy, including a rousing ring-in-the-new-year concert; dazzling fireworks above the skyline; a special recitation of a classic New Year's Eve poem; thrilling ice skating, and plenty of scintillating nightlife. Gamla Stan, which is Stockholm's old town, is a favorite location for locals and visitors, where you can listen to the New Year's Eve concert called Nyårskonsert in Swedish at Storkyrkan Church in the early evening. The church has been a Lutheran church since 1527. Originally, it was a medieval cathedral that was built in 1279. It houses unique objects such as the St. George and the Dragon sculpture, dating back to 1489, the legendary Vädersoltavlan, the oldest oil painting in Sweden from 1535, and Lena Lervik’s sculpture of Biblical characters Joseph and Mary from 2002. Bundle up against the chilly elements and go ice skating in Kungstradgarden, a park in central Stockholm. It is commonly known as Kungsan. The park's central location and its outdoor cafés makes it one of the most popular hangouts and meeting places in Stockholm. The ice rink was modeled after the ice skating rink in Rockefeller Center in New York City. Kungstradgarden opened in 1962 and is popular with visitors from mid-November until March. You can visit Stockholm's Skansen, which opened in 1891 as the world's first open-air museum, where you can listen to Alfred Lord Tennyson's "Ring Out Wild Bells." The New Year's poem has been read by a famous Swede every year at midnight since 1895. The reading is broadcast live nationwide. This year is going, let him go. Preceding and following the reading, enjoy music and fireworks as they light the sky over the water next to Skansen. 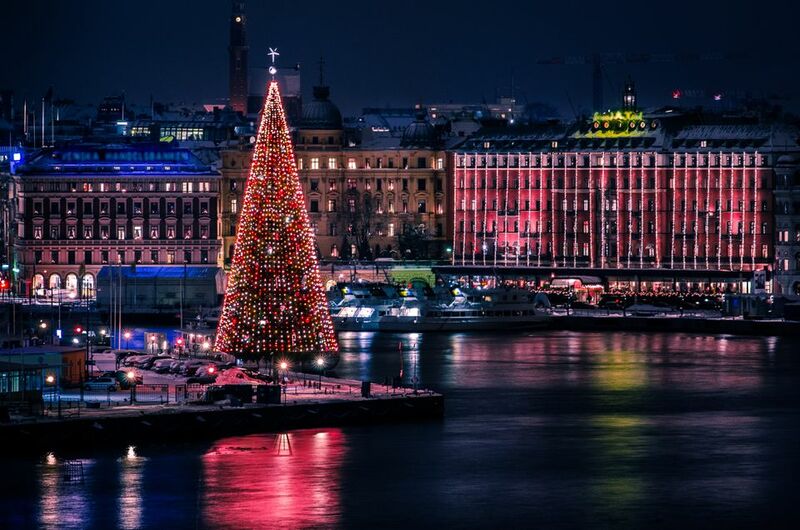 The entire inner harbor at Stockholm's old town is ideal for fireworks viewing, but at Skeppsbron you have the added bonus of the giant Christmas Tree as part of your backdrop. Some good places to view the fireworks include City Hall (Stadshuset), which is located just on the edge of Lake Mälaren on Kungsholmen, and Västerbron, which is the towering bridge between Södermalm and Stockholm, another excellent vantage point. Fjällgatan is set up high on the edge of a cliff in Stockholm’s Södermalm district. After viewing the fireworks there, you can find plenty of nightlife steps away. After the fireworks, head to Södermalmstorg, a large, open area where residents and visitors often meet before heading off to local restaurants and nightclubs. Located on Götgatan street in the city's Södermalm district, the trendy "SoFo" neighborhood offers a myriad of vintage stores, eclectic shops, clothing stores, galleries, and an abundance of hot spots to eat and drink. You can find vibrant nightlife in this district where you can wish your companions gott nytt år, or "happy new year," until the wee hours of January 1.